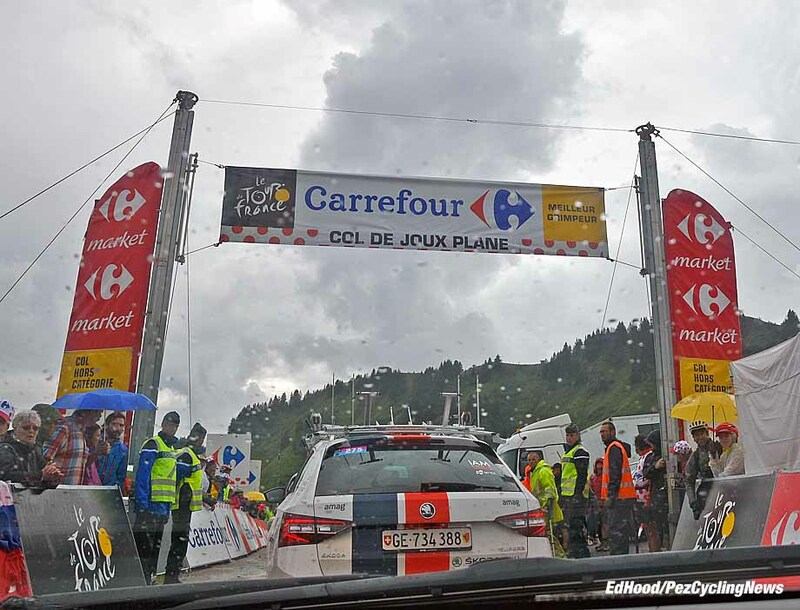 PezCycling News - What's Cool In Road Cycling : TDF’16 Roadside: Only Joy For Ion On The Joux Plane! 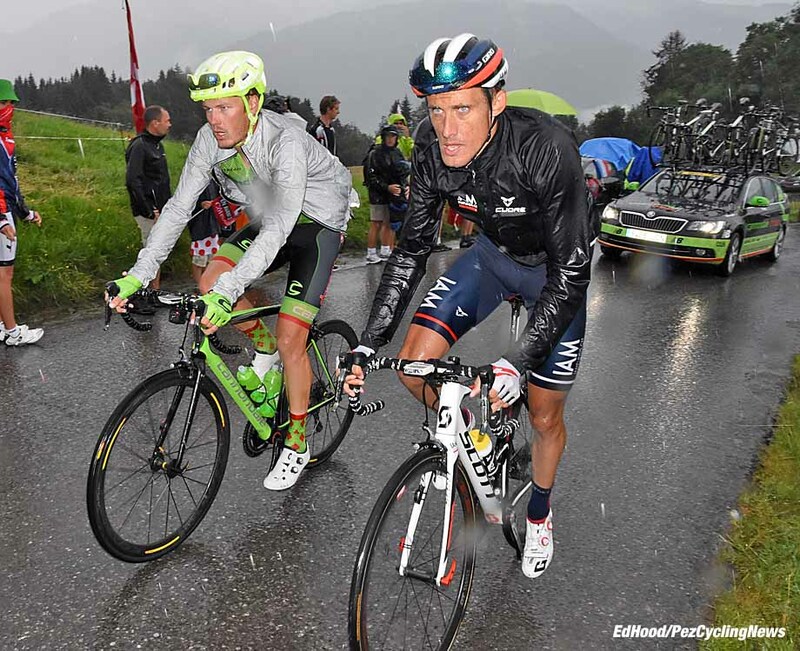 TDF’16 Roadside: Only Joy For Ion On The Joux Plane! 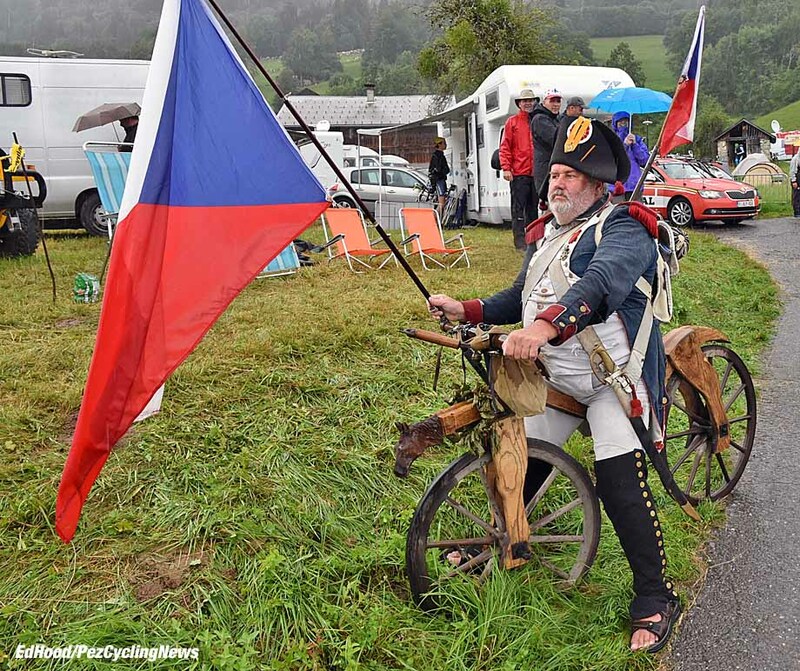 TDF'16 Roadside: A day which many had hoped would give le Tour a Grand Finale as the non-canine contenders scrapped for the podium places behind top dog Froome became a grim slog as a fierce electrical storm turned the Joux Plane into a battle for survival rather than a battle for the podium. The ghost of the Emperor Napoleon was on the hill; he said it was the closest thing he'd seen to his retreat from Moscow. One wounded - whether physically, mentally or both - man after another with very, very few having their sights set out on victory, just survival. The 'thousand yard stare' was much in evidence. We'd hoped for fireworks but gunpowder doesn't work well in the damp - especially sheeting, hammering rain. 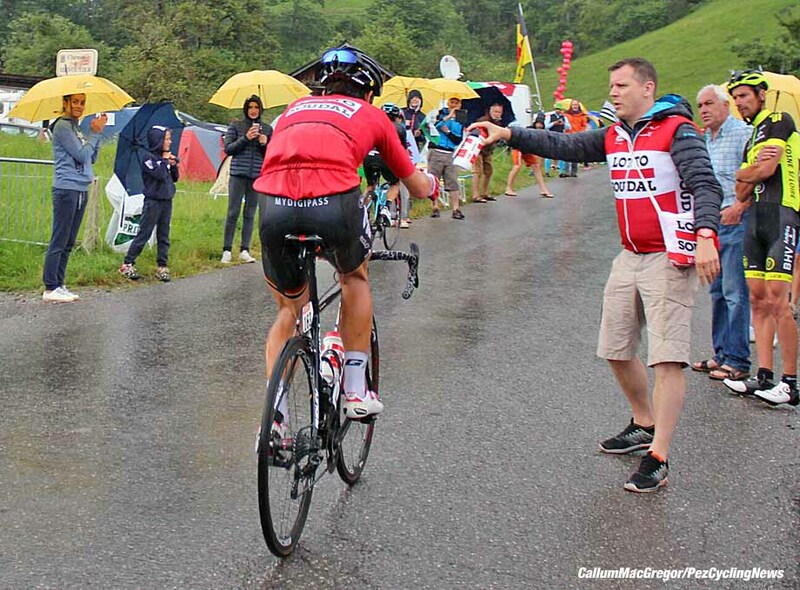 Etixx's pocket man of the Ardennes, France's Julian Alaphilippe lead past us with Colombian Stage 15 winner, Jarlinson Pantano. 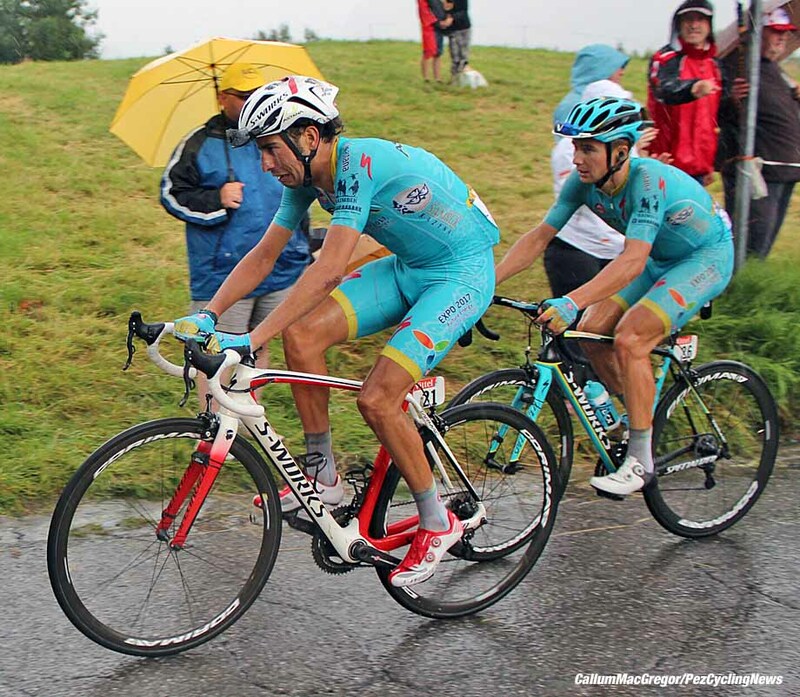 Next up was Giro winner, Vincenzo Nibali (Astana) hoping to salvage his Tour - again. 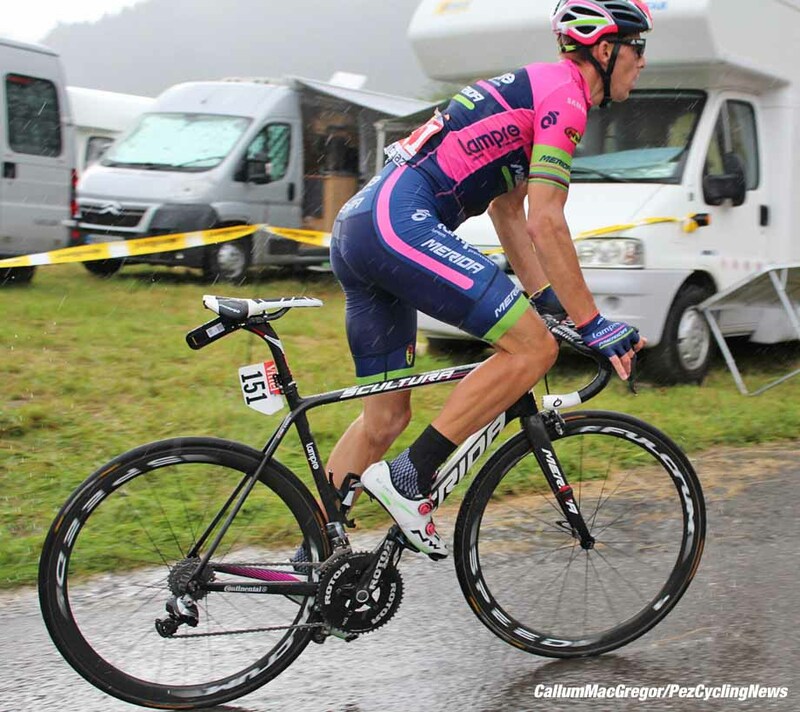 Ever aggressive Rui Costa (Lampre-Merida) was next up, the man was away all day yesterday - he might not win much but he races. 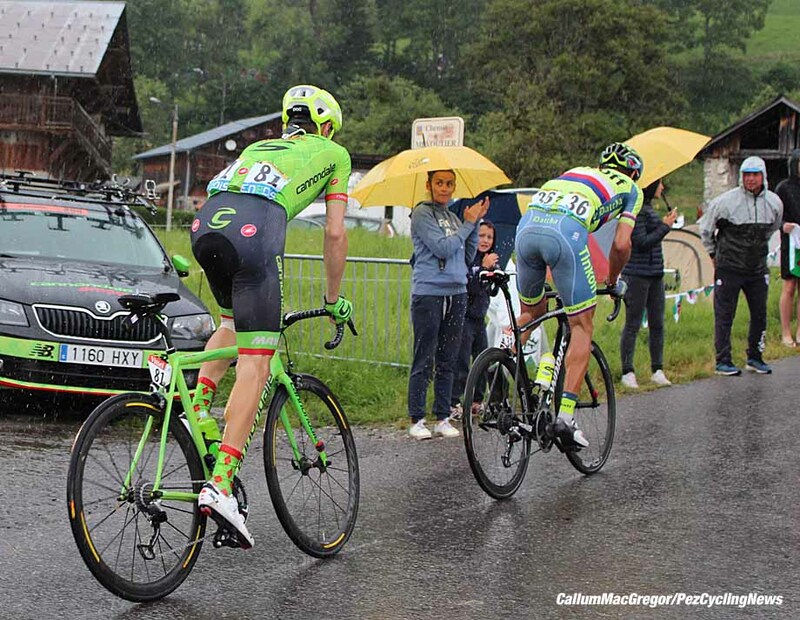 Behind was a group containing Roman Kreuziger (Tinkoff), Stage 17 winner, Ilnur Zakarin, Jon Izaguirre (Movistar) and Pierre Rolland (Cannondale-Drapac) for whom we have renewed respect for his gutsy riding - his crash yesterday looked SORE. After those names it looked to us that palmarés were less of a worry than handing the bike to a mechanic and heading for the shower. The Bigs all looked 'done' to us with attacking not an option; the GC remained unchanged except for one man cracking and tumbling - more on that later. But let's go back to this morning, and the joy of leaving behind Arc 1600 and our 'Shining' digs. First there was the road closure and worrying diversion signs but the panic subsided on that one when we discovered the detour wasn't actually two hours after all. Then there was the road closure with the parcours in sight; we just moved the barriers and 200 metres later, voila! It's Saturday so the crowd is good - the sun's out and so are the nice old cars. It's not too savage ‎but very windy - this will be another tough day as those who lost time yesterday battle to recover it or just try to survive. ‎The descent is long and fast - good for hauling back the minutes. 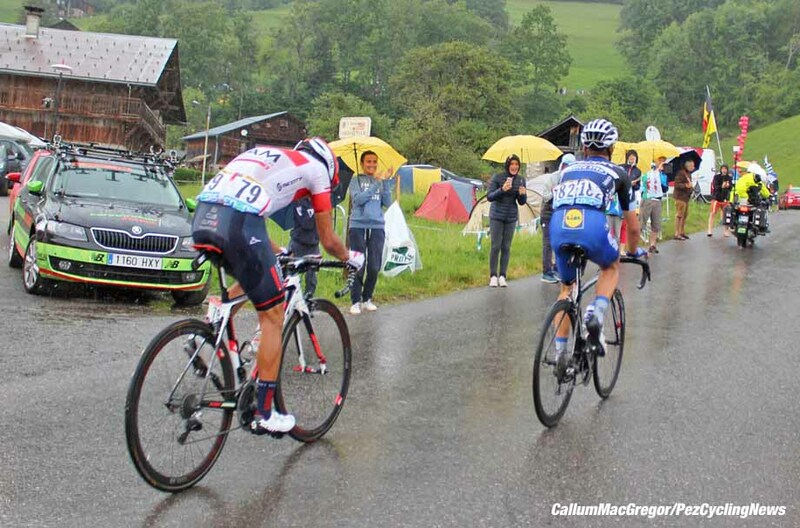 Next on the agenda is La Col de la Colombiere, 11.7K @ 5.8 % - it's not too savage, relatively speaking. The valley floor, fast, flat, safe and again a place to chew back time. 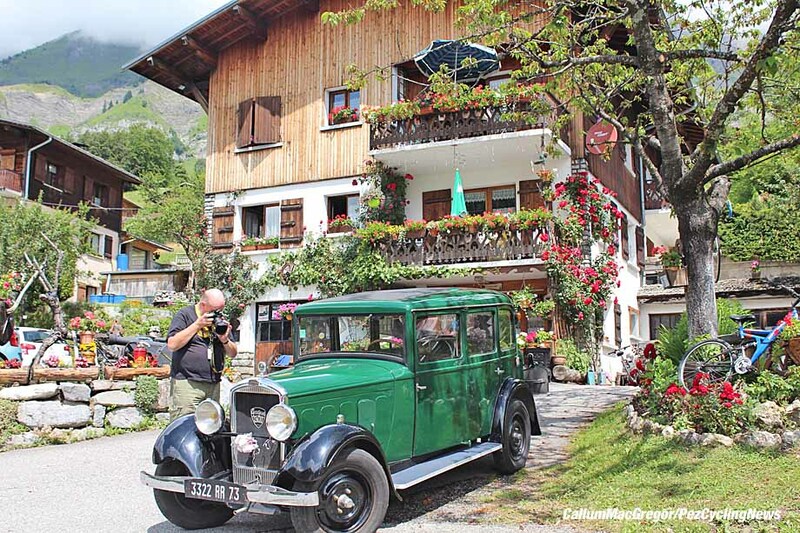 The third climb of the day is the Col de la Ramaz, 13.9K @ 7.1% but only essential cars are allowed over, even some of the Tour's own cars have to take the diversion with us. Apparently the surface is really bad? 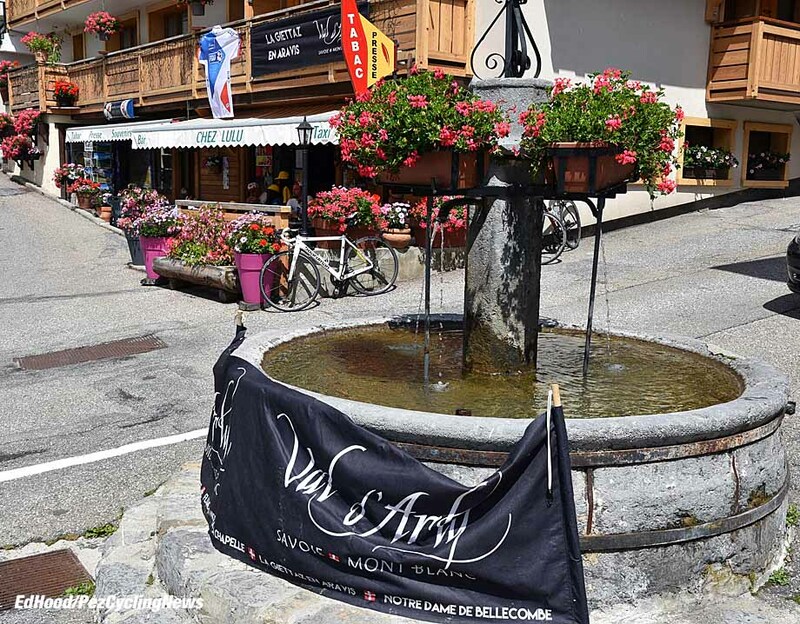 We pick up race route where the coureurs come back down off the hill. 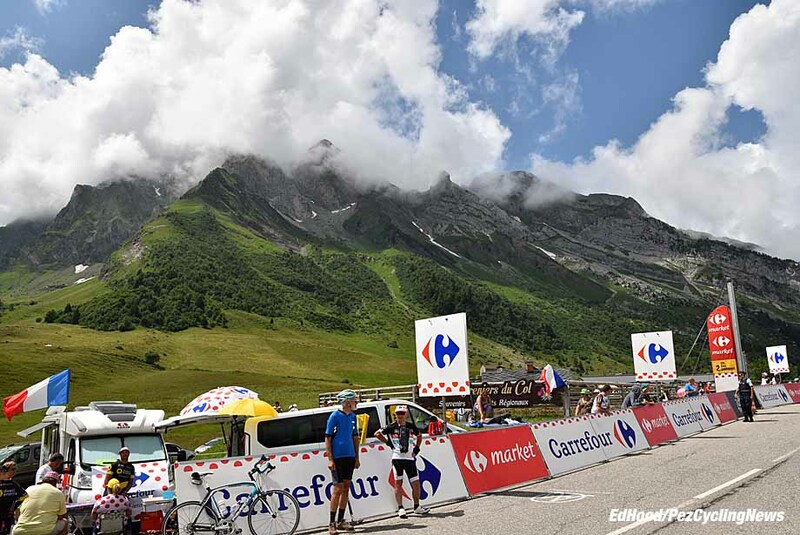 Valley floor again as we roll ever closer to the main event - the HC Joux Plane, 11.6K @ 8.5% average - the final climb of the 2016 Tour de France. It's nasty, starting steep, easing then kicking up and now the heavens have opened and the breeze is a serious wind - the 20 K banner is in real danger of blowing away. The rain ‎is now at a level Noah would recognise, drumming hard on the Toyota roof. Overhead the lightning flashes, the sky rumbles - this is turning into one horrible afternoon. 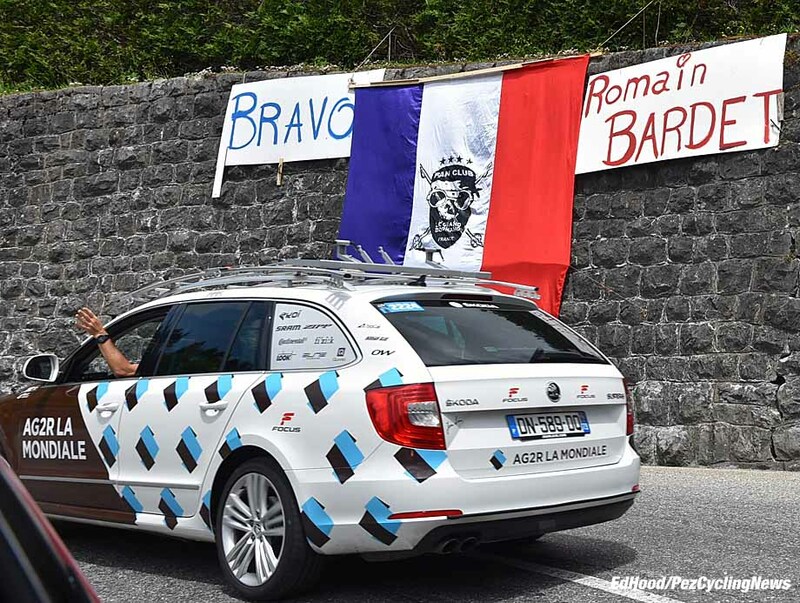 We park up around half way up, we don't want to go too high or we'll get caught outside the barriers - ‎the organisers will be taking no chances after the Ventoux debacle. There's little to do but wait as the rain pours down - all the fans have disappeared into their cars, campers or farm buildings. There's a breakaway on the Ramaz but it's splintering we hear - thus far The Bigs are all together in the peloton. 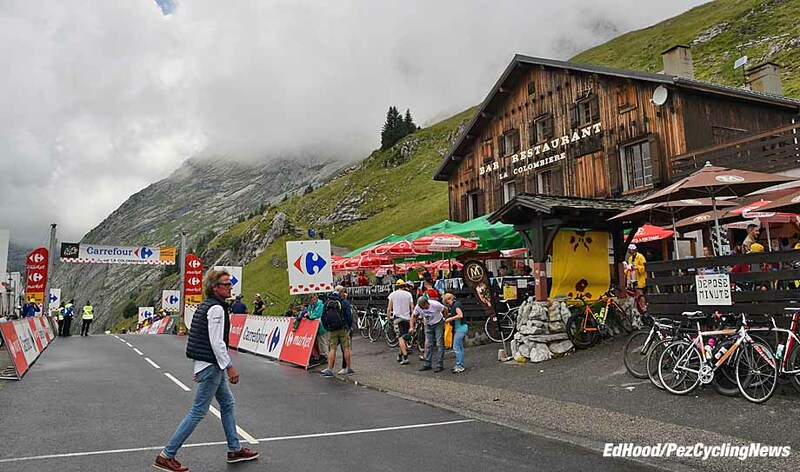 Race leader Froome (Sky) is out of sight with a four minute plus lead but Quintana (Movistar) is only 16 seconds behind second placed Bardet (AG2R-La Mondiale) - and it turn, the Colombian is only ‎19 seconds ahead of fourth placed Yates (Orica-BikeExchange). Porte (BMC) is only 31 seconds behind Yates with Aru (Astana) a slim six seconds behind the Tasmanian. It's all to race for - maybe? 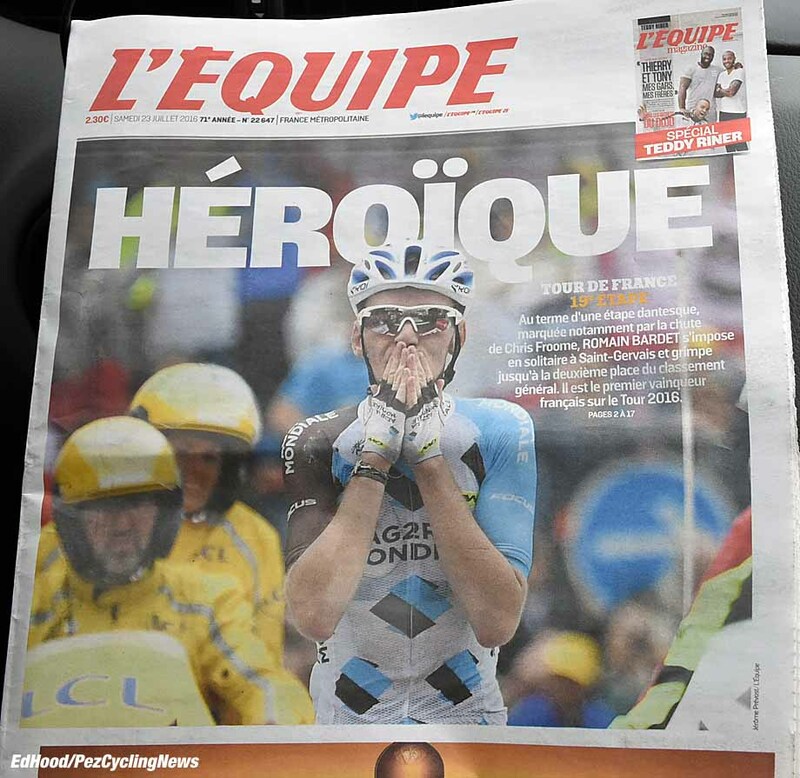 Bardet is again on the cover of l'Equipe, today; 'Heroique' says the headline. 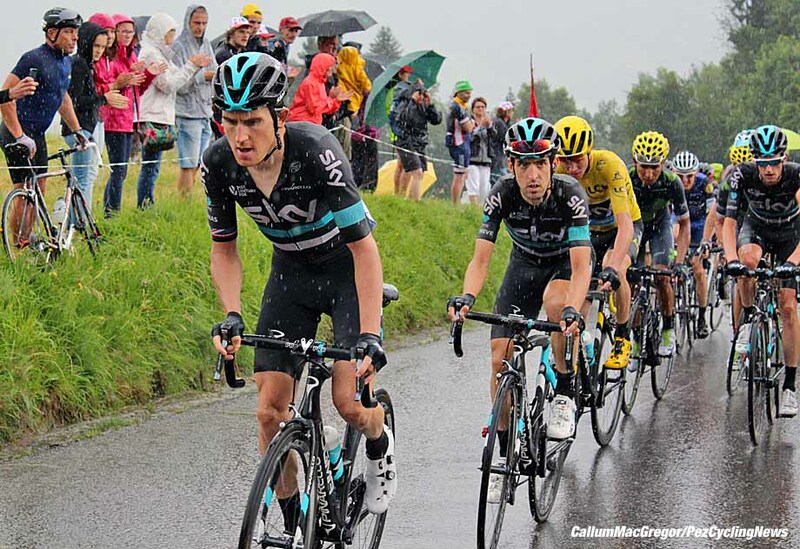 Inside they chart the fortunes of The Bigs, taking Froome in yellow as the datum. 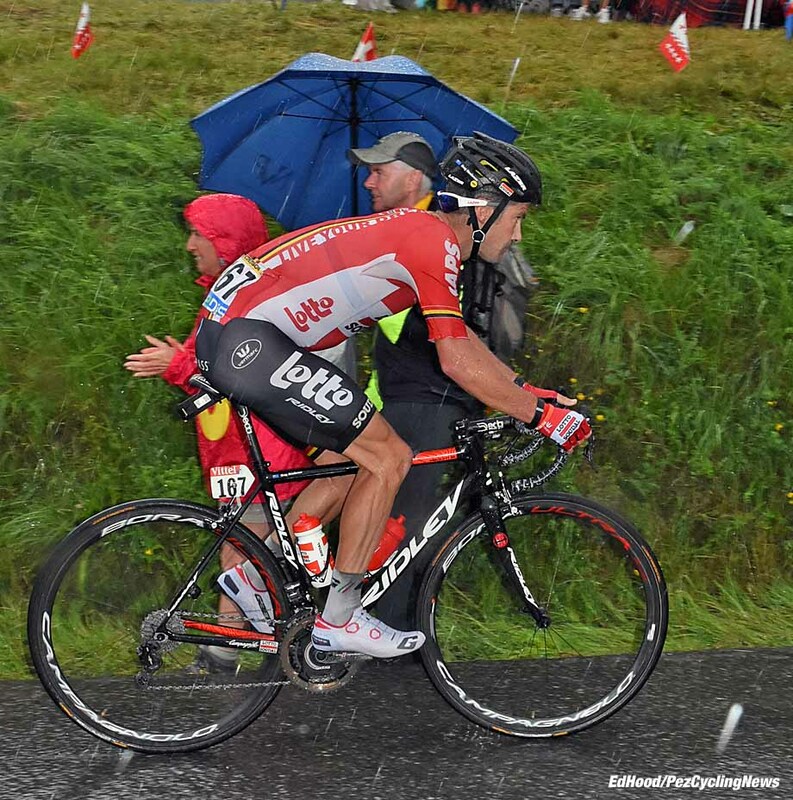 Mollema is the biggest loser, dropping from second to 10th. Yates too loses, third to fourth. Quintana gains, fourth to third, as does Porte, sixth to fifth. But the biggest gainer is of course the Frenchman, fifth to second. ‎Eventually we can hide in the car no longer and Cochonou hat on my bald head and Tour de France carrier bag over the Nikon we step out into the murk. 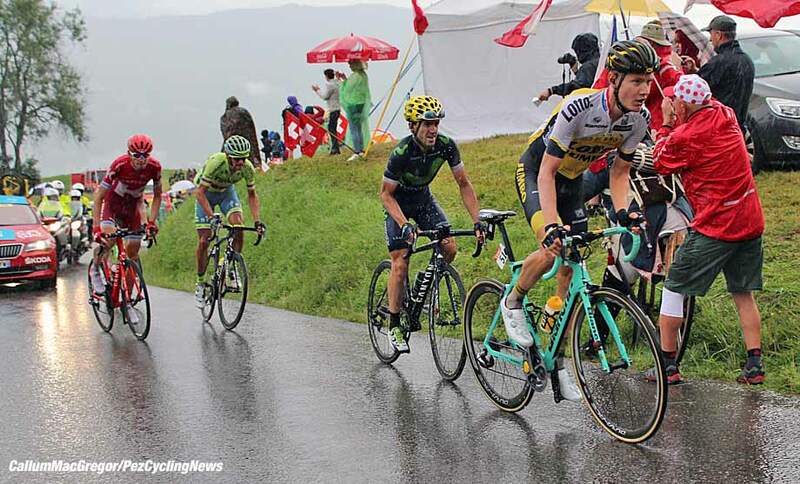 The stage win would go eventually go to Izagirre, we knew it would go to one of the lead group - no one was racing after them, just "stayin' alive." 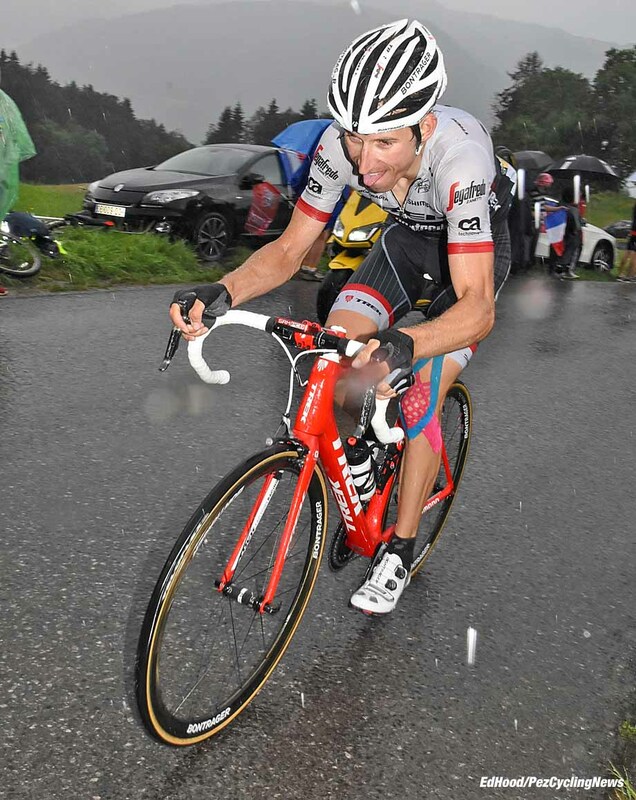 After the leaders came Henao (Sky), De Gendt (Lotto Soudal) then hard chasing Bauke Mollema, trying to get back up the GC after his disastrous day yesterday. 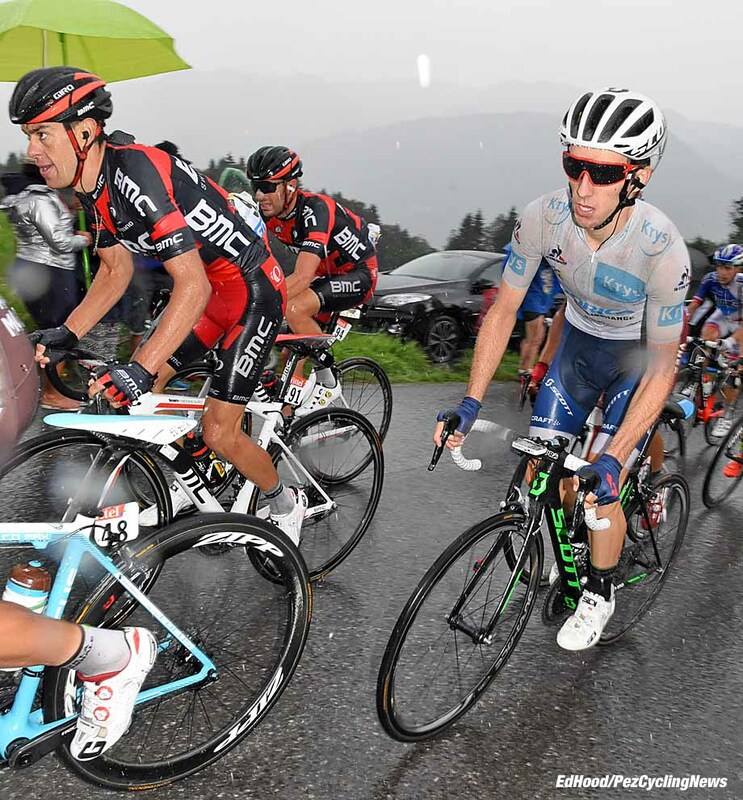 The peloton was lead by Sky with Geraint Thomas on point; Porte and Adam Yates was near the back and one look told you there was no thought in his head of attacking anyone. After the bunch they came up in one's, two's, three's - but what's this? 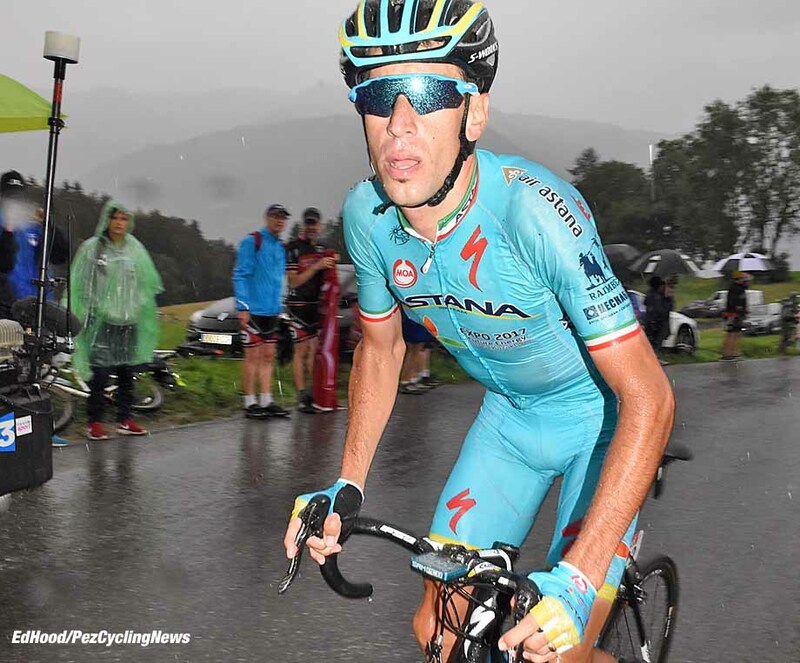 A mini Astana peloton; with a wasted Aru in tow, no top ten for the Sardinian then - enter Kreuziger in tenth spot. Then a procession of wasted men, with even Sagan looking tired after a day working hard to boost Kreuziger into the top 10. The gruppo struggles past; there's zero chat but there are still men behind the gruppo - we have Greipel lead out man Lotto's Greg Henderson as stone last. 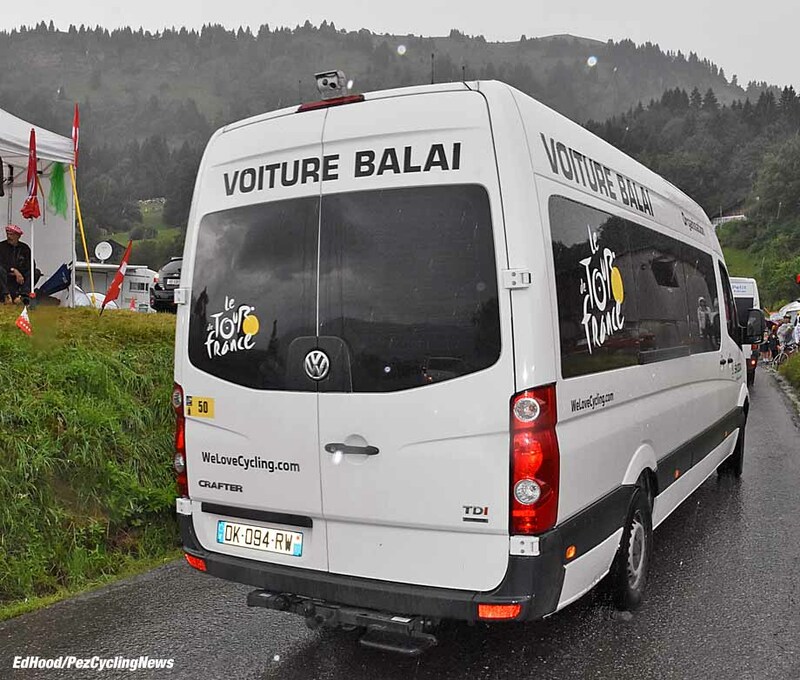 There's the voiture balai, time to GO! 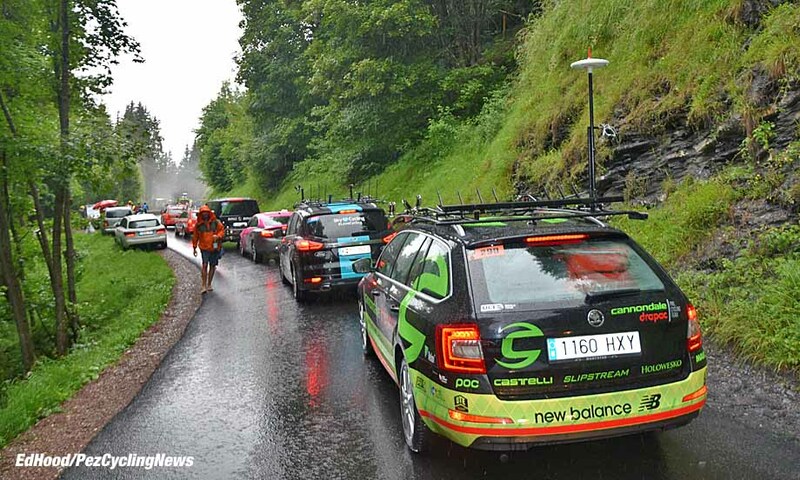 We join the queue behind Cannondale and Sky and join the Wacky Race off the mountain. It's a relief to reach Morzine and exit the chaos - the satnav is already programmed for the digs. Edit our pictures, a bath, a hot meal and a robust red are what's needed now. 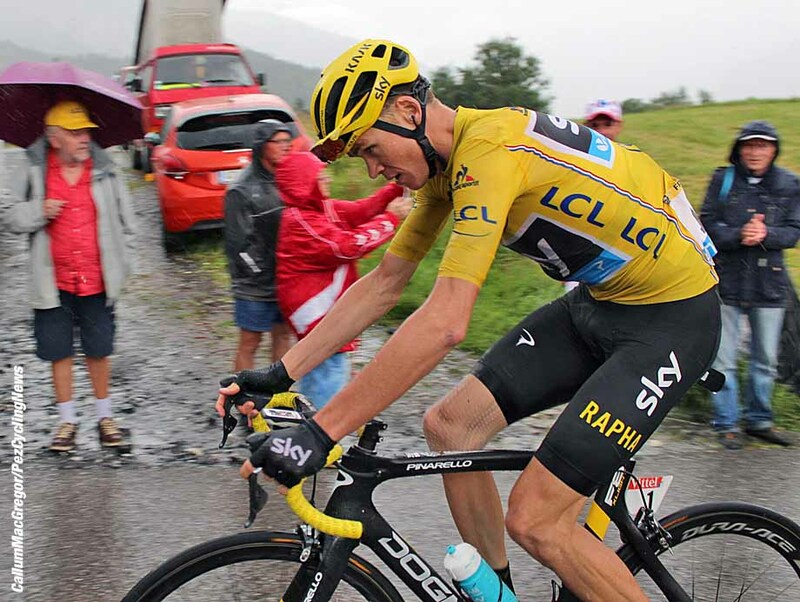 Froome wins, no surprise; Bardet second, respect; Quintana third - a tad lucky; sympathies to Mollema and Yates - it's a ruthless sport.